Eventually, you have to stop studying your own fungus, and start looking at fungi found by other people. If a first scan of the literature doesn’t give a match for morphology or cultures, and the DNA sequences don’t get the answer, you have to examine other species, other cultures, and generate new DNA sequences of potentially related fungi. Sensible people stop at this point. But this is the frightening bridge you have to cross when you stop playing at identification, and begin scientific, taxonomic study. Whatever the liverwort fungus is, it sits in taxonomic mist. To describe a new species and genus now would just thicken the fog. We need to dive deeper into history, and find specimens left behind by previous mycologists. Recently, we were introduced to the Cornell Herbarium and the surprising things sometimes found in such institutional collections of dried specimens. When I was a grad student, I had the chance to examine many specimens from a different herbarium that must remain anonymous, made by a scientist who must also remain anonymous. I couldn’t find anything on these dried twigs and leaves, but my feelings of ineptitude lessened when a colleague told me that this particular mycologist was an obsessive-compulsive confined to a lunatic asylum following a Significant World Conflict. He was allowed into the garden for an hour every week to collect fungi but had no microscope and his keepers only allowed him paper that he could fold into herbarium packets. So he pretended to find and identify fungi, and the specimens are preserved for posterity in a Significant International Collection. They are borrowed mostly by naïve graduate students; everyone else knows better. The Friday Afternoon Mycologist must bare his soul here. I skipped over the sooty moulds too quickly last December, hoping for an easy answer. Now is the time to reconsider some neglected fungi, starting with something called Microxiphium. Probably fewer than ten living people have seen the type species of this genus, M. footii,1 and known what they were looking at. The existing illustrations are rather cartoonish, so it is hard to guess whether it might be a close relative of the liverwort fungus. In the herbarium of my home institution, there are many specimens of this species. I rehydrate a bit of one specimen to make it easier to make a slide, using a wet piece of KimWipe (a highly scientific lab tissue perhaps invented to deal with a particularly messy baby named Kim). 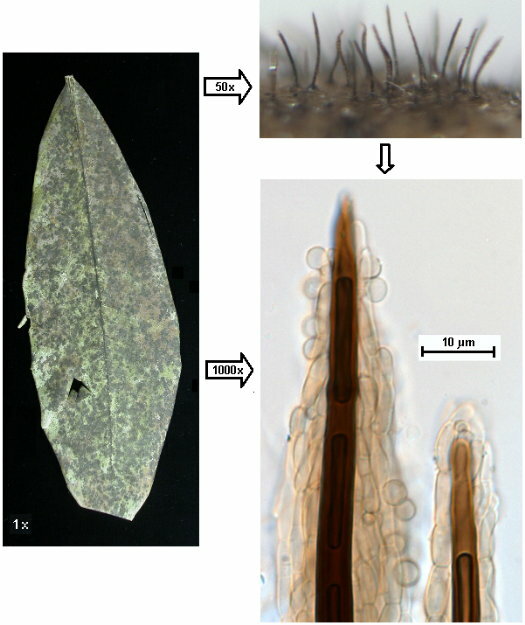 Micromycologists have many gadgets for making slides.2 Today’s tool was a gift from a student, a tiny diamond-shaped blade designed for eye surgery, and with it, it is easy to scrape up the dark needle-like structures of M. footii jutting out of the Rhododendron leaves. So here’s Microxiphium footii. The main feature of this fungus is the dark, thick-walled central spine that runs up the middle of the hyphal bundle, something lacking in the liverwort fungus. The little round cells near the top are apparently the cells that make the spores rather than the spores themselves. Despite a lot of slide making, I cannot find any spores. But the spore-producing cells of the liverwort fungus are cylinders, not round. So M. footii is very different from the liverwort fungus, and this is certainly not a genus for our fungus. But there’s a trick. Other species of Microxiphium have been described, and an inconsistent concept was applied as species were added. Some species are hyphomycetes, other coelomycetes, others even sexual Ascomycetes. What’s more, the generic name is spelled in two different ways, with Microxyphium the alternative, and sometimes these are treated as distinct genera rather than different spellings. Perhaps somewhere in this mess of about 42 described species, lies the liverwort fungus. The only way to find out is to sort through all the descriptions, all the literature, and try to eliminate as many species as possible on the basis of reliable reclassifications and existing illustrations. We know the spore size and shape for our fungus… these are characters that are difficult to get wrong. For the remaining species, it will be necessary to try to find specimens for comparison. Rather than try to revise (i.e. re-describe and re-illustrate) everything, I will just move on looking for our fungus. But I’m not optimistic. Just stubborn. Microxiphium footii has as its sexual state something called Dennisiella babingtonii, but we don’t need to worry about that because we are interested in things asexual. One famous mycologist told me he used his own thick eyebrow hair, mounted in metal handles, to remove delicate structures from specimens. Jewelers’ forceps are wonderful for tearing tiny structures off twigs and leaves, but the tools are aerodynamically designed to fall to the floor, where they always land on the very soft tips… I have many pairs with gnarled ends, and sometimes when I am bored or frustrated, I try to fix them (LAUGHTER). About tools for us working with miniatyre things: Go to any insect-enthusiast and beg for the smallest insect needles (000.something). With two of these I have been able to separate easily the hymenium from a 300 Âµm across pyreno. Type specimens are saved because only a small sector – instead of a whole apo – can be used. These tools also land better than the smallest and terribly expensive forceps …. they nearly soare. Inexpensive jewelers’ forceps can be fixed using emery paper in 400, 600 and 1500 grit. Fold the paper in two with the grit side out, grasp with the forceps and pull. Once the ends meet, hold them shut and sand off the sides of the tips. You can get a mirror finish by following up with finer abrasives such as the micro-mesh 8000 and 12000 grit cushioned abrasives. The finest grits are also useful for grooming the ends of tiny insect pins mounted in wooden matchsticks. What is the tool, you refer to as diamond-shaped blade, named?